University of Akron (UA; OH) polymer scientists have created synthetic duplicates of patterns used by spiders when constructing webs that may lead to stronger and more efficient commercial and biomedical adhesives that could, for example, potentially attach tendons to bones or bind fractures. "This adhesive architecture holds promise for potential applications in the area of adhesion science, particularly in the field of biomedicine where the cost of the materials is a significant constraint," lead author Dharamdeep Jain wrote in "Synthetic Adhesive Attachment Discs Inspired by Spider's Pyriform Silk Architecture," published recently in the Journal of Polymer Science. Mimicking a technique used by spiders when spinning webs, the researchers created synthetic replicas of "attachment discs." These discs are created when spiders pin down an underlying thread of silk with additional threads, like stiches or staples, explains Ali Dhinojwala, UA's H.A. Morton professor of polymer science and head researcher on the project. This "staple-pin" geometry of the attachment disc creates a strong attachment force using little material, he adds. In order to replicate attachment discs, researchers used a process called electrospinning, in which an electrical charge draws out very fine fibers from a liquid material -- in this case polyurethane -- to create a network of ultra-thin threads. 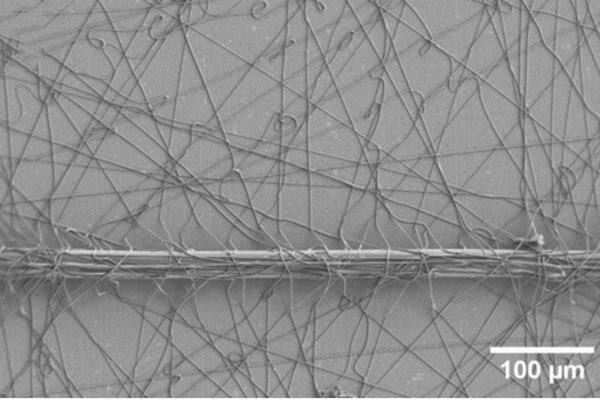 These threads were then spread out over the top of an underlying nylon thread, effectively pinning it in place the same way a spider pins in place one of its threads. "Instead of using big blobs of glue, for example, we can use this unique and efficient design of threads pinning down a fiber, says Dhinojwala. "The inspiration was right in front us, in nature." Dhinojwala and the other researchers claim that the adhesion achieved through this process could be strong enough to attach tendons to bones or to bind bone fractures. Such a technique, they say, could provide cheaper, more efficient, and ultimately more accessible modes of medical treatment. "Experimental and theoretical evidence are provided to confirm the advantages of thousands of micron-size 'staple-pins' and their low peeling angles to enhance the adhesive forces required to peel the natural and synthetic attachment discs,"the researchers wrote in their paper. "These results provide a unique architectural design for fabricating new adhesives that uses very little material for various biomedical and material science applications." Stephen Levy is a contributor to Qmed and MPMN.